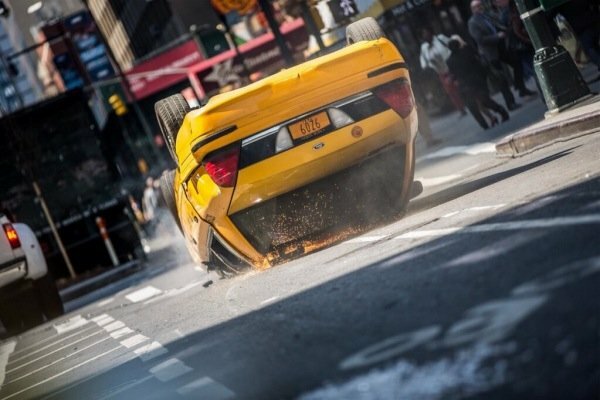 Marc Webb has a vendetta against taxi cabs, and he’s using The Amazing Spider-Man 2 as an excuse to unleash holy hell on those yellow vehicles of doom. Earlier, the director happily Tweeted photos of a smashed taxi, suggesting the exploits of any number of super-powered villains who are expected to be in Webb’s Spidey sequel. Today, the director is back on Twitter giving an all new meaning to the term “hailing cabs.” Check the image out above. Now, I’d want to say that this is carnage created by The Rhino, who will be played by Paul Giamatti in Webb’s sequel. But it also could be the work of Electro (Jamie Foxx) or any number of other villains whose names are surfacing with regard to Amazing 2. We have been hearing that Webb could be building to the formation of The Sinister Six in his Spidey franchise, adding The Vulture and The Green Goblin as major pieces to his puzzle. We already know that Chris Cooper is on board to play Norman Osborn in the sequel. His transformation into the Green Goblin is inevitable. Does it begin with a cab flip? The above image looks like it takes place in Times Square, where Webb has been busy filming his follow up to The Amazing Spider-Man. We know that Andrew Garfield will be back in action as Peter Parker and his costumed alter ego. Emma Stone is back as Gwen Stacy, joined by Shailene Woodley playing Mary Jane Watson. And Webb has cast a bevy of excellent character actors as villains. The Amazing Spider-Man 2 will kick off next year’s summer season on May 2, but we also hope to hear more about the sequel at Comic Con, so stay tuned.